Killer Characters: What's on your to do list? Maybe entering a giveaway for Hospitality and Homicide. What's on your to do list? Maybe entering a giveaway for Hospitality and Homicide. Jill Gardner from Tourist Trap Mysteries. Author Lynn Cahoon. Book 8 - Hospitality and Homcide Releasing May 16th. Hey guys, it’s Jill - coffee shop owner, bookstore owner, and mother to Emma, my golden retriever. My author is letting me out a few days early to start promoting our new story, Hospitality and Homicide. I love it when she takes the stories I tell her and weave it into a book that everyone can enjoy. This time we’re talking about the time Nathan Pike came to town, a second time. I shouldn’t laugh, but boy, Greg didn’t like having him in South Cove. Mostly because having the author around was like having his own little brother. Nathan wanted to do everything that Greg did, I was surprised he didn’t try to come home with Greg to get the full effect of how a small-town police detective lives. Greg was mad enough that I turned our couples trip to the Jensen Farm into a group field trip. Honestly that was more Aunt Jackie’s fault than mine. And Greg can’t say no to my aunt. He can hide from her, but if she asks for something, he’ll do it for her. That’s one of the reasons I’m head over heels for the guy. We’re busy here in South Cove. I’ve got school, and I need to hire a new barista/bookseller for the store. Nick’s gone back to school already and well, we lost someone else too. But I don’t really want to talk about it. Aunt Jackie and Harrold seem happy. Amy and Justin are doing great. And Josh is even living like a human being, instead of Oscar the Grouch. Now it we could just get Mayor Baylor to find any shred of human compassion, we might just become the second happiest place on earth. 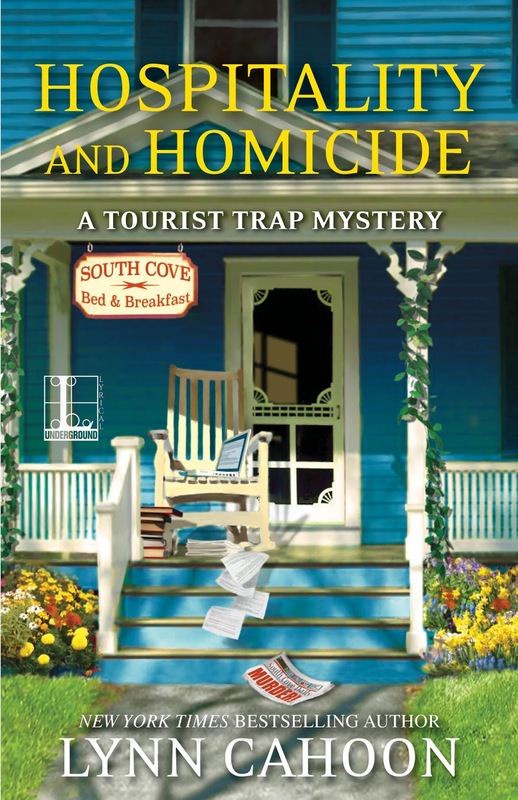 I’m thinking about doing a class project for one of my classes on the effect of having B&B’s instead of a real hotel on South Cove’s tourist trade. According to Bill and Mary, they’re always booked, even in off season. I wonder if having a clean, upscale hotel in the area would increase traffic. Or would it have the Walmart effect on the smaller businesses. These are things I think of now, and I blame my aunt. She’s the one that convinced me to go back to school and get a MBA. At first, I was doing it more for her than me. Now, I’m enjoying the classes and projects. Speaking of class, I’ve got to get going. I’ve got a class in less than an hour and at least a twenty minute drive ahead of me to Bakerstown College. Make sure you stop by Coffee, Books, and More when you come into town. I’d love to see you and talk books. I still work full time, so that takes up a good portion of my day. I hope to make some towel bibs for my two grandchildren. dbahn(at)iw(dot)net. And read some books, mysteries of course. Work is the devil. :) But it keeps food on the table. My daughter's baby shower is keeping me busy. Much too busy. Sorry to say, I am fighting a virus which is taking too much of my energy. Perhaps this is good for the increase in mystery reading time though! Loads of family paperwork to get done this week. Trying to get started on the Spring cleaning after a very long winter. I could go on, but I won't ;). I am busy with work and working overtime, plus trying to get a wedding cross-stitch sampler finished. mcastor07(at)Gmail(dot)com. I used to love doing cross stitch. What an interesting idea--B&Bs vs hotels and their impact on the local economy. I'd love to read a study. My characters are always thinking up new things for me to think about. I love my boys. I have two poms about 15 pounds each. Taking care of a sibling with a broken ankle. Hope the ankle heals quickly.. It's finally warming up here---so I'm plant shopping and planting what I bring home. I need to check on my herb garden when I get home. It's been raining enough they should be good, but they might be swamped. I so need to spring clean. I'm busy this week rearranging my kitchen and getting the sunroom ready for the spring and summer. Have fun. A sunroom sounds lovely. 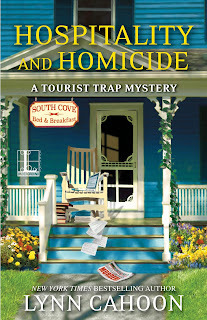 I am busy participating as a Beta Reader for Judy Sheluk sequel to "Skeleton in the Attic." We struck up an online connection when I was an advanced reader for that book, and I voiced, well, wrote my interest in being involved with her next book in a more active way. I did pull out my retired 'red pen' and helped with a book from another one of her series, so I'm not entirely a newbie to the process. So, this week I am channeling my inner teacher. It's true...a retired teacher never gives it up. Kathleen, that's so nice of you. I hope you enjoy! What a great way to spend your week. Enjoy! Hi Jill! Working everyday after a long weekend off! I am looking forward to your new adventure and have always wondered what will happen with the Mission wall! Thanks for the chance to win! I'm busy editing two books, reading, and spending time with my grandchildren. Hi Peggy, nice to see you. Resisting the healthcare vote. I spend my day fighting for healthcare rights for all. As a breast cancer survivor, I know the need for good healthcare. Working and cleaning. Doing a major clean out before a major knee surgery next minth. Smart idea. It took me a few months to recover from my hip surgery. Mostly reading this week. So I am all over the globe! I've heard that from several people. :) Enjoy. Reading books for book clubs. I also have an Afghan I need to finish before it gets to warm. We worry about our babies. Hope everything goes well. Everything went fine, thanks. I'm happy to have her home again. Taking care of 3 dogs and babysitting my granddaughter! What type of dogs? I have two poms that rule the house. Winner, winner!! I've emailed you your prize. Thanks for playing. An author friend got one during the RT convention. I'm not that brave. Oh my goodness, I'm so over the top excited for this release!!!!!! This week I'm busy getting ready for at Etsy Spring Market that starts tomorrow. Today is work, work, work (the boring regular 8-5 kind that pays the bills) and tonight is set up. Fingers crossed for a good event tomorrow. Me too Amanda! Are you coming to the Facebook party on release day? I'm retired, but it seems I still don't have enough time for everything! Hubby and I set up another raised garden bed today. We already have three 4 x 4 beds set up in a row, but I made the mistake of planting lemon balm in two of them. They are in the mint family, so they spread like wildfire. I have iris, bleeding heart, horehound and some sneaky peppermint in the center one. I'm going to use the new double bed for herbs that don't spread like mints! Other than that, I'm trying to downsize so I can get a room cleared out to use for an office. I like to write mysteries (not published yet) and need a sanctuary away from the TV. :) Somehow it is harder to clear stuff out than it was to pile it in there in the first place. I get to take care of my son and DIL's dogs along with my one little guy every day (and night). There are 6 in total and they don't take care of them at all so I get to do it. Along with that, of course, I get to play on my computer. So, it's not all bad.